Boy Scout Troop 230 now offers a great program to celebrate your support of Scouting through our Flag Plaza Pavers project. 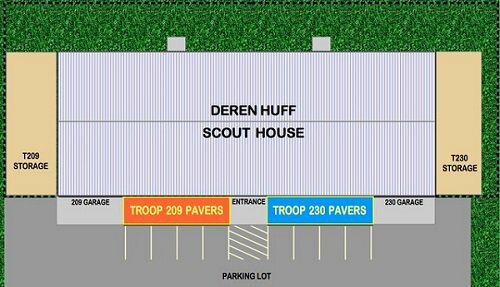 In front of the Deren-Huff Scout House is a large pedestrian area covered in blank paver bricks. ALSO, additional keepsake 4”x8” TILE copies of your paver can be ordered for only $25.00 extra. And all proceeds from the sale of pavers will support improvements to Troop facilities, equipment, and programs! In its history, Troop 230 already boasts more than 100 Eagle Scouts, with more being added every year. 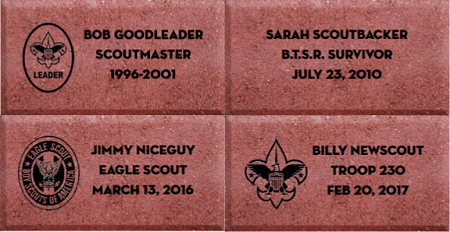 Flag Plaza Pavers offers a great way to celebrate achievement by you, your Scout or family member, PLUS create a lasting monument to the dedication and work required to achieve Scouting’s highest rank. And yes, if you order multiple bricks, you can keep one for your own memories! mail in your order, download the form and fill in the required information, then return to any uniformed rep at a regular Troop Meeting in the Scout House. • Eagle Scout logo for use on Eagle Scout commemoratives only, please! For any questions or help regarding this fundraiser please email Brett Nicholson at aggiebrett@gmail.com. And thank you for your support of Scouting and BSA Troop 230!